Their paper, appearing in Nature Climate Change, shows how large-scale climatic changes drive a coordinated rise and fall of numbers of aphids across Great Britain, even when individual aphid populations in that nation are separated by great distance. The researchers studied a phenomenon called “spatial synchrony,” revealing how changing climate can effect ecological populations through increases in average temperature and changes in how climatic fluctuations in different areas relate to each other. 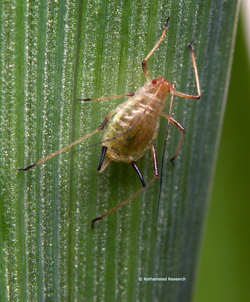 “If you care about crops, you have a reason to care about how climate change affects crop pests like aphids,” said Daniel Reuman, associate professor of ecology and evolutionary biology at KU and senior scientist with the Kansas Biological Survey, who co-authored the paper. “If you eat, you have a reason to care about crops,” he said. The scientists looked at decades’ worth of population surveys of 20 aphid species carried out with suction traps throughout Britain. In the data, they searched out triggers for shifts in spatial synchrony among aphid numbers over multiple timescales — triggers that, until now, have been hard for researchers to determine. Using “wavelets” — a statistical technique for dissecting variations by time and timescale — the researchers found the key influence on aphid flight timings are winter temperatures, even though aphids first fly in springtime. The researchers linked their results to the North Atlantic Oscillation. The NAO is a large-scale climatic oscillation, like El Niño in that respect, but mostly over Europe and the North Atlantic. “These oscillations affect many species and also human industries like fishing,” Reuman said. The timing and population size of aphids have a major effect on a number of important commercial crops, according to the KU researcher. Beyond aphids, Reuman said the team’s findings would deepen understanding of how climate influences spatial synchrony in many different species of animals and could have implications for public health and commercial endeavors. Reuman’s collaborators on the research were Lawrence W. Sheppard at KU and James R. Bell and Richard Harrington at Rothamsted Research. The UK Natural Environment Research Council, National Science Foundation and KU supported this work. 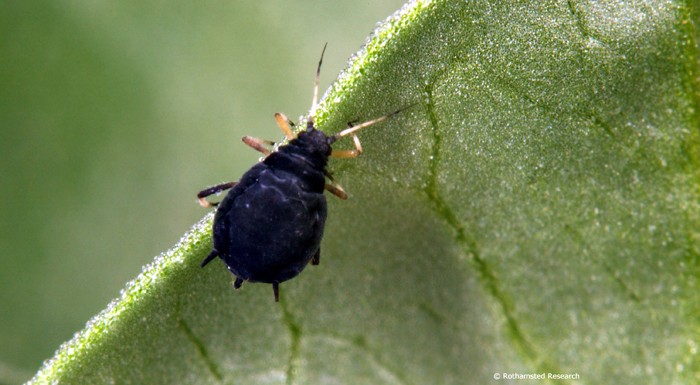 Top Photo: The black bean aphid (Aphis fabae). Photo courtesy Rothamsted Research. Graphic (larger size available): Changes in winter-temperature synchrony mirrored changes in the NAO. Wavelet mean field magnitudes for winter temperatures from 13 long-maintained UK weather stations (a) resembled their counterparts for the 11 aphid sampling locations; the comparable part of the plot is indicated by black lines. 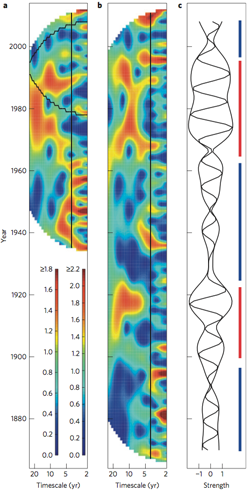 A normalized wavelet transform of Hurrell’s winter NAO index (b) showed similar features on long timescales (4–27 years). The real part of the 10-year-timescale component of this NAO transform is plotted in c. The envelope enclosing the fluctuations in c is the height of b at 10-year timescale. Times for which long-timescale NAO oscillations were strong (red) or weak (blue) are also marked in c.